It's been raining since morning and when it's cold outside and the weather is gloomy, I feel like eating something hot and yummy. Yoshinoya perhaps? When I was in Tokyo, we dined at Yoshinoya countless times. Firstly the price for a set meal is very affordable; starting at 550 yen, which is extremely cheap for Tokyo standards. 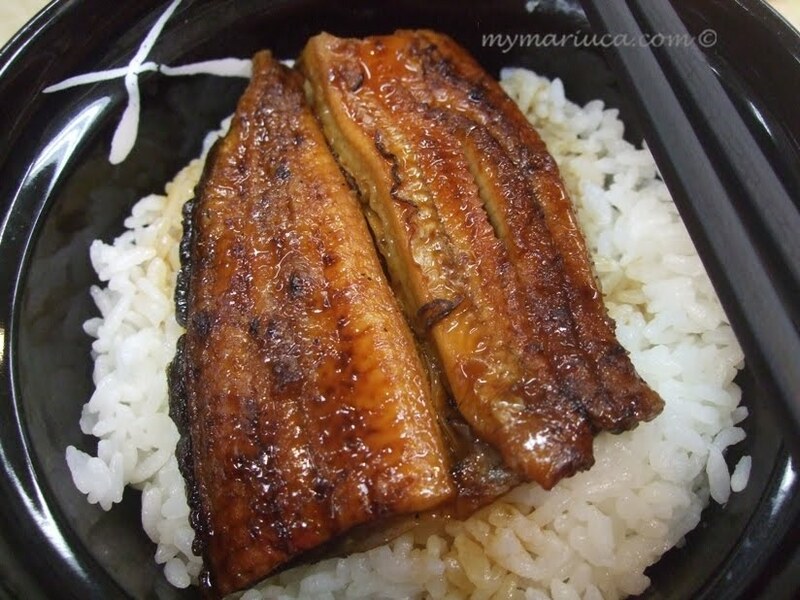 Secondly, Yoshinoya in Tokyo serves Unagi-don or grilled eel and let me tell you that it's totally delicious! The Unagi bowl comes with miso soup and vegetable on the side. I'm so glad I was feeling adventurous in Tokyo and I enjoyed this dish more than once for each time I had it, the Unagi-don did not disappoint me. The taste was consistently yummy and made for a delicious filling meal, be it lunch or dinner. And right now, I'm totally craving for Unagi and I hope Yoshinoya Malaysia will start serving this tasty set meal soon! yayks! feelin lah hungry now GP! Never tried that unagi Marzie, the ones that i usually see are in Jusco Maluri, but i dont feel that adventurous to try em, especially sold at Jusco ones. Haha. Olla, yeah, just for a while only. Going to do my prayer in a short while. I am having a beef, chicken and prawn Tom Yam for evening. Me too hungry hippo GG!!! Yeah GG, still drizzling here…brrrrr! Whole week raining GG…very cold now! I was in da loo just now GG! Now waiting for B to come home with food!!! I was pretty happy when Yoshinoya open in Malaysia but sadly, Yoshinoya Malaysia is not the same standard as the one in Japan. It is yummy yum GG, u try one day okay? Same here GG…. Hungry to da max now! How come haven’t eaten GG? Wat’s for dinner btw? Rise and shine GG! Which blog eh? I like the rain GG but so cold now Brrrrrr! Ha ha PJ=Petaling Jaya… KL= Kuala Lumpur! Damn hot oso I don like GG, I wan it to snow here in M’sia heheheh! LOL sure GG! Tito B caught in traffic jam I think! Of coz they won serve it snake-like GG, worry not! Unagi Don di Yoshinaya tu sedap sungguh yer? Ahhh begitu rupanya. wah soft n tasty memang tetap rasanya. weeeeeeeeeeeh! me too! but i wan snow only during christmas.. :* :* :* :* making lah snowman! ho-ho-ho-ho! Why GG? BD is it??? BD=Blockbuster Diet. He he now u know GG… me in PJ! Tastes better than roasted tuna! I doubt anyone will serve ell in its snake-like condition right? How to eat? Yowzaaaaa! Ohhhh u staying up to study GG? Me too sleepy cause weather so cosy and cold! If I see snake being served, I’ll run out of the restaurant in a jiffy! No turning back, scared la GG!!! :-D :-D :-D me tooooooooooo GP! LJ! Missed the chop sweetie! Ha ha u not scared GG wan to blog whole day on snake LOL! My dinner is here edi GG, you? Still no wan eat? How come no internet yest? ah.. A loves it too!! but me. no lah. yelah.. i fell asleep just now.. I just had dinner, now sleepy weepy…. U try la LJ! Maybe ul like… but try the nice one.. I mean yg nicely cooked..
hah.. itu yg takut tu.. kalau makan yg best nanti terus serik kan? U mean kalau makan yg tak best? This one very nice, I first time try pun terus suka, but B didn’t eat it , it seems he he! Ha ha I am I am adventurous when it comes to food, and then tak sedap komplen hahha! Unagi? Yucks... :p I have tried once with my wife and both of us didn't like it. looks delicious. I received this beautiful award and i am passing it to you. If you love to grab it, please do so. Thanks so much. Recent blog:=- My very first tag and award. Hi Mariuca! How are you keeping? Hope everything is fine there. i've not tried unagi before but it certainly looks yummy. unfortunately, i'm observing a vege diet for 49 days following my late FIL's death. we are not suppose to eat meat during this grieving period. in a way, hopefully his spirit will become clearer, calmer and filled with loving kindness. btw, thanks for the beautiful awards, much apppreciated. good night and keep well dearie. hugsy. I fell asleep at 10 pm just now! Yest I didn drop kan, but I woke up early so I managed to drop but 270 only for WOAFS, the other 2 complete! wakey wakey?hahha.. i want to go to bed edi! So early wan to sleep LJ? Hahahha mentang2 la Ibaru bangun hahaha! haha.. tulah.. been awake morning lah.. lol!! Heheheheh bestnye program u LJ, alih2 je dapat many followers yeeeehaw! Yeah lucky I woke up!!!!!! Tenkiu LJ! ok am heading on to bed now.. see you guys later..
Nite nite LJ, sleep tight! have you ever thought of writing a novel ??? Morning Kim! Oh this is so yummy, seriously! He he! Wow! Looks yummy to me. I love Japanese food, I was in Japan in Chino-Nagano, a beautiful country-side resort way back in 1990. In fact, in 1998 if I am not mistaken, the Winter Olympic was held there. I was there in winter and return to Malaysia in early spring. It was a such a good experience living in Japan for a few month. I learned to speak a little of Japanese and know how to sing some Japanese songs too. But till today I really miss their food so much (I mean only the Halal one!) At least in KL, there are many Japanese Restaurant where you can go to, here in Terengganu, don't ever dream lah! Hey kawan, ada good news and a little improvement, I've updated the "Top Monthly Commenter" column followed by the current month, i.e. November '09 Top Commenter column. returned, months, etc, hope you can figure out, next time I must checked before I press submit. It really not so nice with mistakes, right? Ok to make typo here Lil since our resident typo cop Bem tengah cuti tu lol! eh cannot add anymore is it? But we can try to win followers from the draw…kalau lucky la! yeap.. we can try lah..
i like eating their gyudon beef and tempura! so juicy! I normally like to go for Japanese buffet and eat unlimited amounts of unagi! So yummy!!! I don't quite like Yoshinoya Malaysia, wonder if the Japan outlet is better?